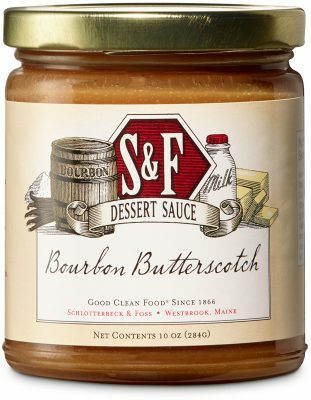 Not just for ice cream, this divine dessert sauce is made from cane sugar, barrel-aged bourbon, molasses, and vanilla. Spoon over gingerbread or apple pie. Whisk into coffee, chai tea, or hot toddies. Spread onto apple slices. Drizzle over grilled bananas or pineapples. Cane Sugar, Sweetened Condensed Skim Milk (milk, sugar), Glucose Syrup, Milk, Butter (milk; salted), Coconut Oil, Bourbon, Molasses, Natural Flavors, Sunflower Lecithin, Sea Salt, Pure Bourbon Vanilla Extract, Carrageenan.